While the peoples of Central America had contact with the major cultures of Mesoamerica and South America, they were not direct members of either sphere. Instead, they developed their own lively artistic traditions: stone and jade carving, ceramic sculpture, and goldworking. 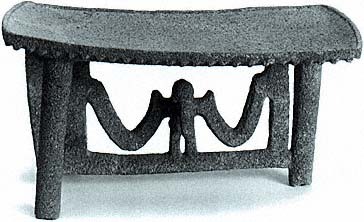 Among the burial offerings of the elite were basalt metates, or grinding stones- decorative forms of the staple item used in every household to grind maize and tubers. It is perhaps because of their crucial role in everyday existence that metates were elevated to the realm of the sacred by the people of Costa Rica. Using only stone and wood tools, they would carve a ritual metate from a single rock and decorate it with jaguars, birds, monkeys, and mythological creatures. In this example a free-hanging panel attached to only one leg is carved in the form of a large beaked bird with outstretched wings. Along the upper rim is a series of triangular incisions, a common abstract motif used to represent human heads.